I was late to the party with Flappy Bird for iOS. But, having seen all the fuss about it in the tech press last week I thought I’d download it and give it a whirl (which, I think, seems to be why most people downloaded it…). I managed to get it a few days before it was pulled from the App Store by its owner because “it’s too addictive”. He’s not wrong. Having played it for a few minutes at first to see what it was all about, it quickly became my go to game for killing time over the past few days. There’s something about the rhythm of taps required to keep the little bird aloft that is addictive. Even though it’s an incredibly hard game to master, it’s simple to play (just tap to keep the bird in the air while avoiding sets of green pipes that scroll by as obstacles) and that combination is deadly. It’s the perfect blend of being challenging enough to not be too easy and simple enough to not be too hard. I find a lot of iOS games either too simple and not engaging enough, or too difficult – either in terms of controls (requiring lots of time to master) or in terms of level / progress design (requiring huge investments of time to get anywhere). For an iOS game, I want something I can pick up and play casually without too much effort. 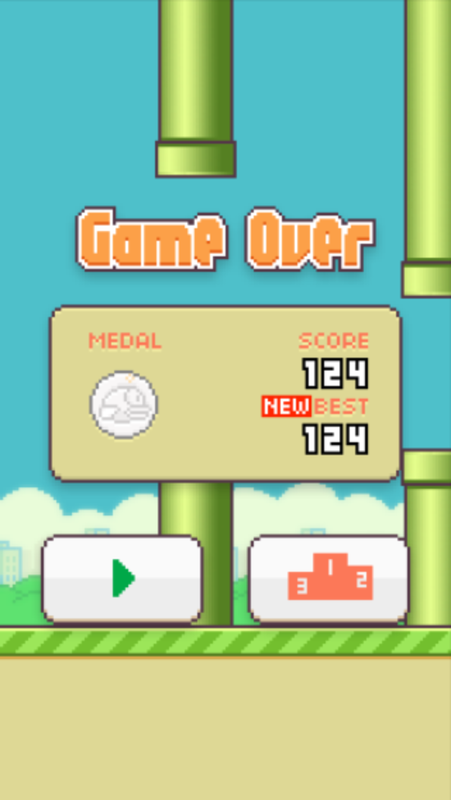 Flappy Bird is just that game. My current high score (as shown in figure 1) is 124. Quite happy with that.